Everlast Blacktop is a dedicated concrete contractor that has proven time after time over the past 25 years that we are committed to excellence with each concrete project. Due to innovative concrete finishing methods, we can create custom looking concrete driveways and stamped concrete driveways. Everlast Blacktop is a concrete driveway contractor that wants to partner with you on your Elk Grove residential or commercial project and enhance the look through property curb appeal. Let us be your only choice for your concrete project. Elk Grove, Illinois is home to Chicago’s largest industrial park and touches the city of Chicago’s borders. Elk Grove is home to a small herd of elk kept in a grove at the eastern edge of Busse Woods forest preserve. Everlast Blacktop wants to show you why we are a leading concrete contractor when it comes to concrete driveways and stamped concrete driveways. Everlast Blacktop doesn’t waste time, but we are a concrete driveway contractor that finishes on time and gives you an accurate quote upfront. Everlast Blacktop prides itself on being a concrete contractor of integrity. Our customers appreciate the open communication and the fact that we address their questions quickly. Whether you are looking for a small concrete driveway or a beautiful stamped concrete driveway, our team can get the job done. 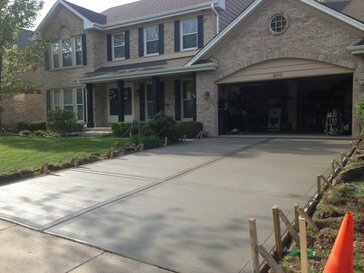 We have years of successfully finishing elaborate stamped concrete driveways and unique concrete driveways. Everlast Blacktop is a concrete driveway contractor you can trust to add value to your property. Call our team at (630) 855-5572 with any questions or to get more information about our full-service concrete business.